For this month’s Test Kitchen, I get to eat lobster thanks to your votes. Some 47 percent of you wanted me to try the “angry lobster” recipe from Tyler Florence’s “Tyler’s Ultimate” Cookbook that I got awhile back. That far exceeded the other three choices: Ultimate chicken wings (23%), hunter’s minestrone (16%), and lemon ricotta crepes (12%). The recipe keeps things simple, with minimal ingredients. I think when cooking lobster, the simpler the better because the lobster meat is just so great by itself. The recipe gets its name from the fact that you have to kill the live lobster, which would make anyone angry. But in Chinese households, a quick chop to a lobster (or crab) between the eyes is a quicker death than boiling. And Florence agrees with me as he instructs you to first pierce a chef’s knife between the lobster’s eyes, then twisting off the claws, followed by cutting through the back and finally chopping the lobster tail into four sections. 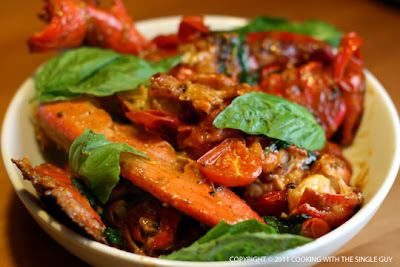 Once I got my lobster ready, I prepped the other ingredients, which was a pint of cherry tomatoes, two handfuls of fresh basil, a teaspoon of crushed red pepper flakes and 3 garlic cloves, thinly sliced. 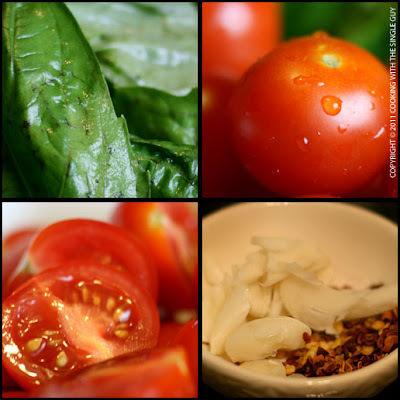 To prepare the dish, I started by warming a little less than a quarter cup of extra virgin olive oil in a large skillet. Then adding the garlic and red pepper flakes to infuse the oil (over medium high heat). With some flour that’s been seasoned in salt and pepper, I dredged the lobster pieces and tossed them into the pan. I cooked the lobster in two batches because it’s important not to crowded the skillet. Florence says to brown the lobster pieces for about 3 to 4 minutes on each side. When the lobsters are all browned, then they all get combined in the skillet along with the cherry tomatoes, cooking for another five minutes to soften the tomatoes. Then add half the basil along with the juice of half a lemon. To finish everything, I added in two tablespoon of unsalted butter, which creates a sauce for the butter. And then I just plated everything up and garnished with the remaining basil leaves. Looks pretty good huh? I don’t know if this is true for all lobsters, but mine had sooo much water in him (or her, I didn’t check) that when I chopped into it, a lot of liquid came out. Be very close to your sink to not mess up your counter top. Try not to use a lot of flour on your lobster pieces, dust them off a bit. The reason is the flour residue in the skillet will turn the butter you add later into a nice thick sauce. But too much flour can mean a super thick sauce. So use less flour or add more liquid or lemon juice at the end to thin out the butter sauce. Definitely serve this with bread to fill you up but also to soak up the chile butter sauce. 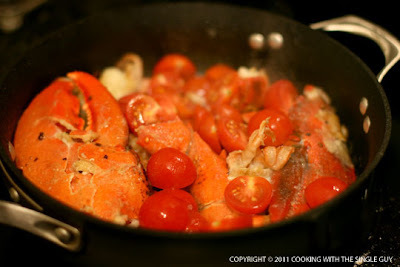 Ease of cooking: Although I’ve done it before with Dungeness crabs, it was a bit tougher killing a lobster, especially the one I got which was huuuge from Boston. The killing part is probably the toughest part of the recipe, and then after that it’s pretty easy. Taste: Keeping it simple, the taste was pretty nice, with the butter and slight heat from the red pepper flakes. I really enjoyed it. I definitely have not put a knife btw a lobster's eyes before. (Yes, my husband gets to do it, too.) 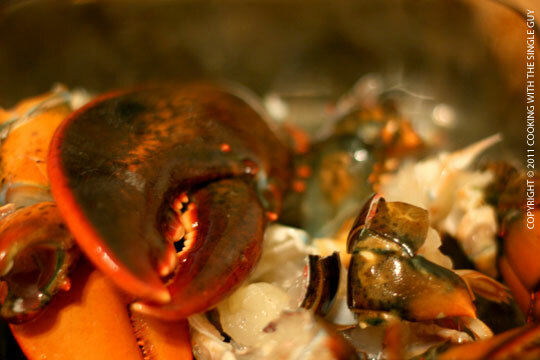 Looks like a beautiful recipe - I agree that letting the lobster meat shine is one of the best ways of preparing it. The reason the lobster had a lot of liquid inside is (probably) because it recently molted. 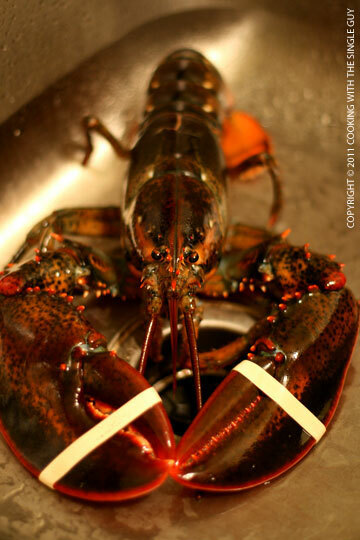 Hard shell lobsters, which are about to molt, are more densely packed with meat. Another reason might be that the lobster was caught some time ago; it survives off its own meat, thus getting skinnier inside its shell. Paying top dollar for your lobster at a good fish market avoids these problems. Blee, that makes sense. My lobster did seem to have little meat in the tail, but the shell seemed pretty tough, not like it just molted. The claws had a lot of meat, though. Mmmmm. Foodhoe, this was at its core lobster in butter, just tossed with tomatoes and basil. I've never actually cooked lobster so I am very impressed that you gave this a go. It sounds really delicious! A little know secret to the best, "Angry Lobster" ever. Three ingredients: oil, garlic and the lobster. 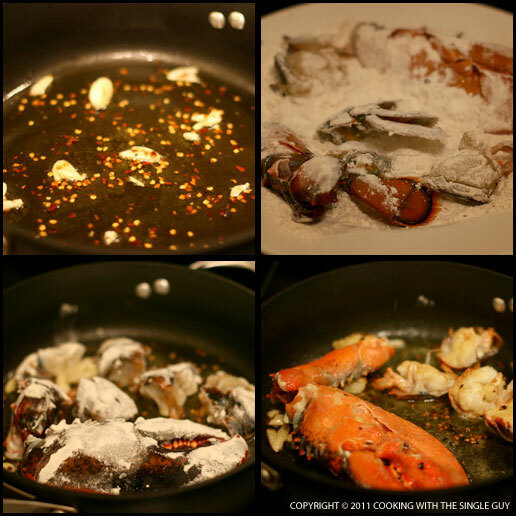 Prepare lobster (but into pieces) sautee in oil with LOTS of whole, crushed garlic. After the lobster releases it's water, throw everything out except the lobster! and continue with new oil and LOTS of whole, crushed garlic. Crusty bread and a good drink. Incredible eating (you owe me). I really like lobster a lot. I ate lobster when I was travelling to Luray, VA. Have you visited Luray, VA? Just to say stunned!!! I was surprised to see this, brilliantly prepared. Well done! !